Cat fleas are particularly nasty because they are literally draining the life out of your pet. 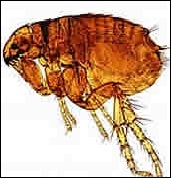 Fleas are bloodsuckers and females can gorge on more than a dozen times their own body weight in cat blood, which of course runs the risk of your cat becoming anaemic. You need to act quickly if your cat or kitten starts picking up fleas because they reproduce rapidly and creates a threat of infestation in your home. If you notice your cat scratching incessantly and during grooming come across specks of dirt in the comb, it's most likely that your cat is experiencing flea bites on its skin. It's important that you begin flea treatment immediately to reduce the risk of infestation developing. You should visit your vet, high street pet store or online shop to purchase a product to deal with the fleas. A wide range of products are available, including sprays, drops, shampoos, dips, powders, foams, collars, flea combs and injectable or oral medication. And a natural flea cream by PetsAlive is highly recommended. New products emerge regularly as fleas develop a resistance to earlier medication. Cats who spend plenty of time outdoors are generally more susceptible to picking up fleas than cats who stay indoors. Fleas love to live in a warm and moist environment - they can live inside all year, and can survive outside throughout the year in a warm climate. It's important to comb your cat or kitten regularly with a flea comb which will catch fleas in its teeth - a combing session is a good way to monitor how effective or ineffective particular remedies for cat fleas are. Many cat owners make flea powder their choice of treatment. The powder should be brushed into your cat's coat and should only be left on a short period of time before being brushed out again, since some cats will lick the powder which may make them ill.
You should stand your pet on a large sheet of paper before brushing in the flea powder. You should then burn the paper to ensure the destruction all for any fleas that have fallen on to it. Also remember to examine your pet's blankets and sleeping area for signs of fleas and disinfect them when necessary. You should also be aware of the risk of flea allergy dermatitis, which is the most common allergy in cats and kittens. If your cat has this allergy, one flea bite can cause a reaction which is equal to 100 fleas. You can detect flea allergy dermatitis by looking for little black and white specks on your cat - the black specks are flea excrement on the white ones of flea eggs. If your cat is suffering from flea allergy dermatitis your vet can begin a program of flea control treatment, which can include giving it cortisone to help break the scratching and itching cycle.